So this was something that initially appeared interesting and definitely modern, but in the end was executed not only improperly but also posed a safety risk! 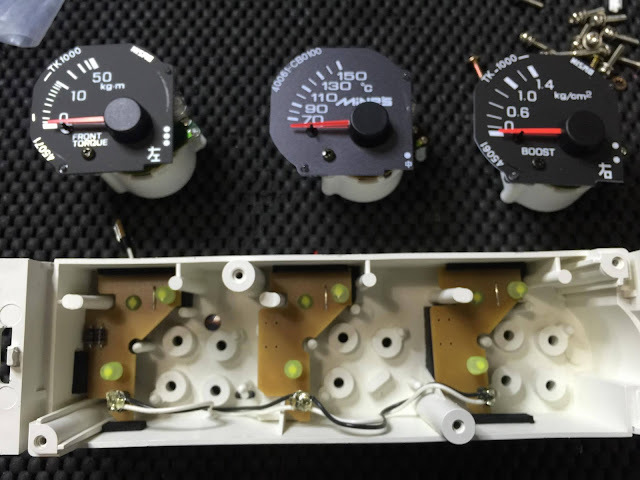 As long time readers recall, I have experimented with using LEDs to replace the standard incandescent light bulbs in the gauge cluster, in an effort to modernize the car. After trying several types of LEDs, I finally found these "flower" type LEDs that seem to do the best job of delivering a consistent, even level of light. The second time I dropped in to WORX Auto Alarm to check in on progress (actually, lack thereof) on my car, Nakamura had told me about a new LED mod for the gauges that he had obtained from a fellow vendor - likely one of the ones who specialize in LED modifications. He told me my 33 would be the first 33 in the world to feature this mod, so I have to admit I was a bit excited. Essentially, instead of simply replacing the standard light bulbs in the gauge clusters with off the shelf LED bulbs (which usually cause uneven lighting), this vendor had arranged to remove all of these bulbs, and replace with several small LEDs on circuit boards that could placed behind the gauges but within the gauge housing. 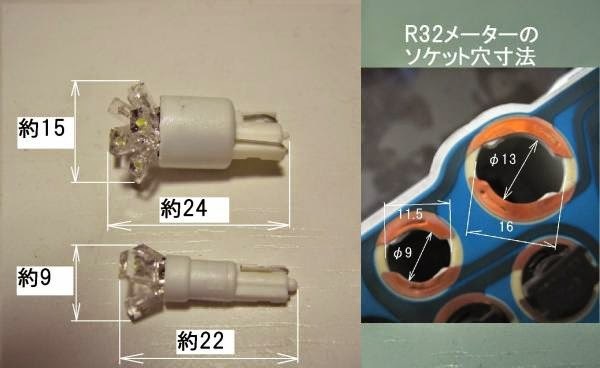 Because the LEDs would be scattered about and in locations where the bulbs could not reach, the lighting would also IN THEORY, be more even and consistent. The look would be like those early Lexus instrument panels, if you know what I am talking about. 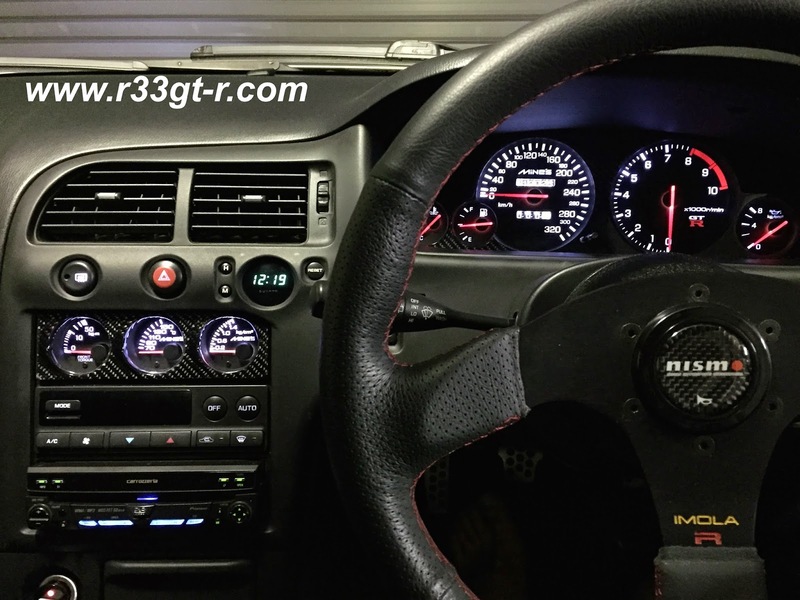 Further, because the LEDs are not simply wired into the OEM wiring, an additional element of control could be introduced - the LEDs could come on full brightness when the engine was started, but then dim when the headlights were turned on. Just like most modern cars! Sounds great, right? I soon discovered a few problems with this set up. First, the lighting was NOT even. In fact, the "flower type" LED bulbs I had used in the past (and again, which Nakamura had THROWN OUT without my permission when he did this mod!!) resulted in more even lighting. Check out this photo below from when I first installed these bulbs and tell me what you think. The flower type LEDs I installed previously - Pretty much spot on PERFECT! Compare this to these new LEDs which show uneven lighting. I can't believe how spotty the lighting is. You can see how the numbers like the "300" and the "MiNE'S" logo are not as bright as the surrounding numbers. The "R" in the GT-R logo has its right foot missing. The red needles are not consistent. Further, when the lighting comes on, the redline portion turned pinkish (the photo above shows the dimmed setting with headlights on). FAIL. Second, while the main gauges now looked modern because of the "full on daytime/dim when lights come on at night" feature, the three sub gauges (which were also modified with these LEDs) did NOT have the same functionality. OOPS. During the day they were not illuminated. 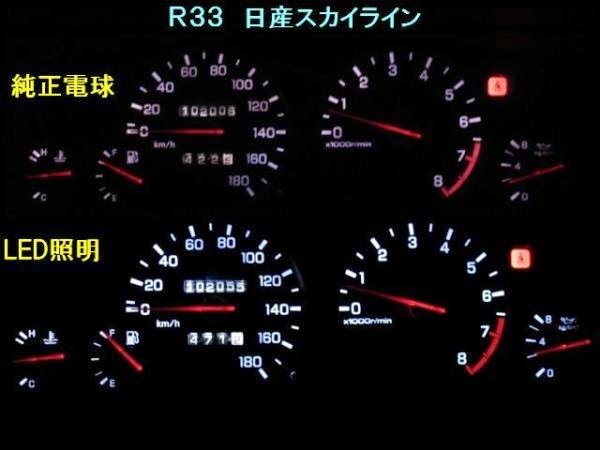 Then, when driving at night, the main gauges would dim, but the sub gauges would come and remain SUPER BRIGHT (i.e. same level as daylight brightness of the main gauges) at all times. Completely distracting and potentially dangerous, I think. Bad photo, but not having the centers gauges light up is distracting. Additionally, the lighting for these gauges turned out uneven. See how the middle gauge is much brighter? 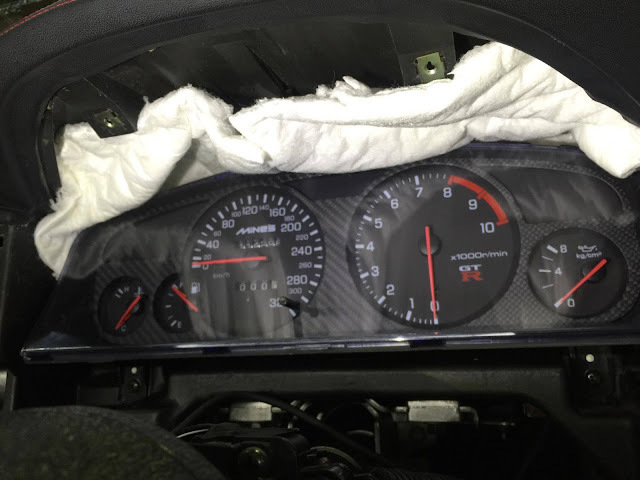 Third, when I got the car home and began to tinker by seeing if there was any way I could fix the uneven lighting problem, I took off the center panel to access the gauges, and found 3M THINSULATE had been stuffed into the space between the gauges and the bottom surface of the cowl. At first, I thought it was to deaden any sounds that might be coming in from the firewall. But while I was turning the lights on and off in an attempt to see how bad the uneven lighting was, I discovered that the gauges were actually running SUPER HOT due to the LEDs! I thought LEDs ran cool, but apparently these did not. Right then, despite the novelty feature I decided that these new LEDs would have to be removed. My biggest concern was that the heat might lead to fading/degradation of the printed areas of the gauges, turning white lettering, symbols or hashmarks to yellow or causing the white to fade (if that happened, that Mine's speedometer would be hard to replace). Especially with the 3M Thinsulate bouncing heat back INTO the gauges. If I remove the 3M, then the leather risks getting baked as well. Of course this is UNACCEPTABLE! 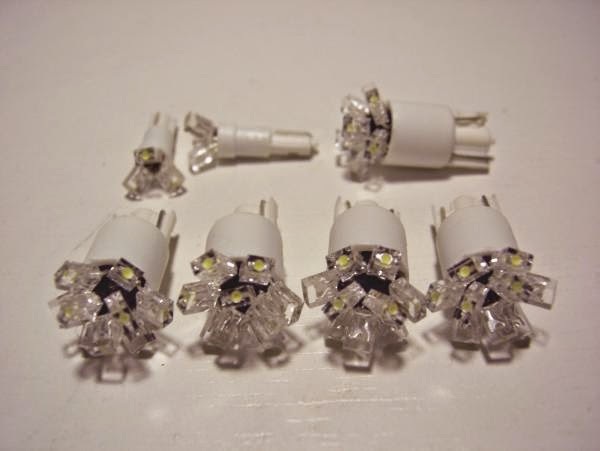 So I immediately contacted the seller of the flower type LEDs I had used in the past and ordered another full set, for both the main and sub gauges (to ensure even coloring and brightness). This guy is nice. Sends the LEDs in little sealing plastic boxes and lots of bubble wrap. Anyway I then went ahead and fitted these back on. 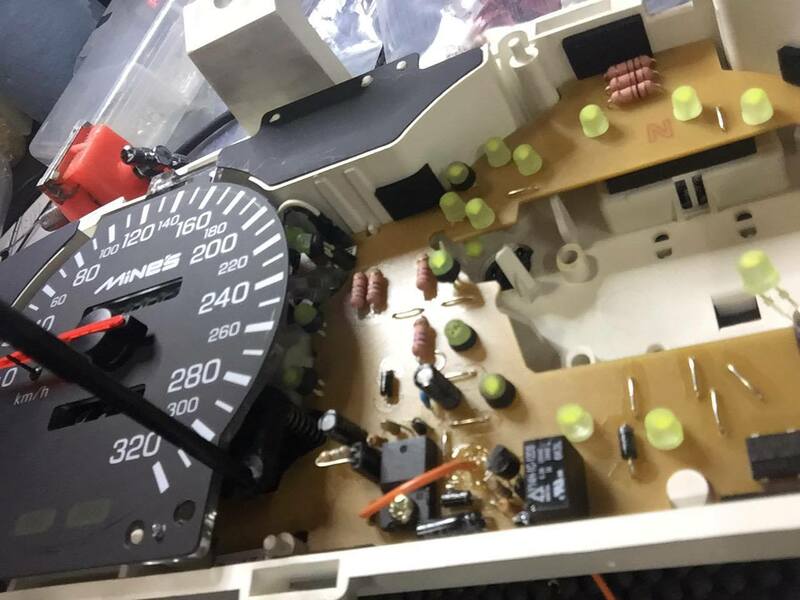 The most difficult part of this was taking both instrument clusters apart, undoing the circuit boards with the LEDs, then installing them back into a spare one which I sent back to Nakamura (because he was trying to charge me 80,000 yen for this mod, if I kept them). Not a great photo but to the naked eye, it's MUCH MUCH BETTER and near PERFECT! So am I finally done with all the issues caused by having left my car at WORX Auto Alarm? Not quite, unfortunately. And the work I need to get done to get it back 100% is going to take some time and effort... so stay tuned... meanwhile I have some other posts of other stuff I've done since I've had the car back from WORX. WORX Auto Alarm. The shoddiest cowboy I have heard of in a very long time..
Hi Aki, not sure if you can share the link for "flower" look LED for cluster? Fingers crossed you manage to unravel everything.